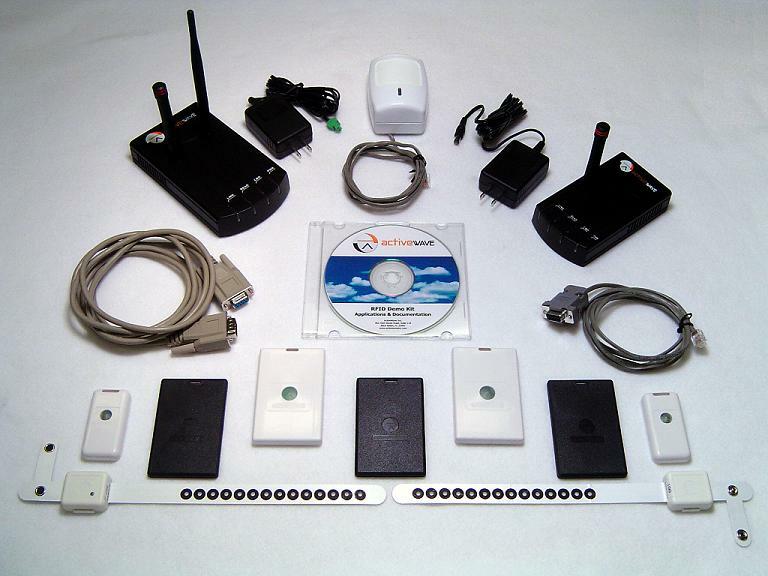 The ActiveWave RFID Demo Kit provides everything you need to demonstrate the basic capabilities of our active RFID System. The Demo Kit User's Guide contains instructions for installing the software applications, setting up and configuring the hardware devices, and running several system demonstrations. The demonstrations are designed to represent real-world scenarios of Access Control, Tracking, and Inventory Control applications. All ActiveWave tags can be configured for any type of application. Every tag has unique anti-collision capabilities to ensure that each tag is able to transmit and receive intended data from the Reader, regardless of how many tags are present. The ActiveWave Reader is the heart of the system. It has three basic modes of operation - program, monitor, and call. When in programming mode, the Reader configures other devices in the ActiveWave system, including tags. When in monitoring mode, the Reader listens to all tag activity and relays this information back to the Host in real-time. The Reader also monitors its inputs for any change in status. When in call mode, the Reader wakes up specific tags, specific groups of tags, or all tags within range. The Field Generator is used to wake-up tags periodically or when activated by a motion detector - both options configurable by the user. When the motion detector is used, it signals the Field Generator to wake up tags whenever movement is detected. The Field Generator can be configured to call a specific tag, specific group of tags, or all tags whenever it activates. The RF range of the Field Generator is also configurable based on the user's requirements. The Demo Kit contains the ActiveWave Programming Station software application and a demo version of the Tracker software application. The Programming Station application is used to initially configure all tags. The Tracker provides all of the necessary functions to monitor and track people, assets, and/or inventory. It uses a database to store all information related to tagged items (people, assets, and inventory) and to store all incoming tag activity. The Tracker displays all tag activity in real-time, warnings for unauthorized tag movements, and changes to the status of any input devices attached to the Reader. The Reader's output relays can also be controlled by the Tracker depending on the validity of a tag at a specific door, a specific time, and if accompanied by an assigned tag (for example, a laptop can only be moved through the exit door during business hours and by the laptop's owner). The API software library is not necessary for running the basic demonstrations. This library contains functions to interface software applications to our hardware. Users can develop their own .NET Host applications that use our hardware, or connect existing enterprise applications to our system. Microsoft Windows XP, Vista, 7, or 8. Pentium class processor or higher. Minimum 120MB of available hard disk space. CD-ROM drive or USB port. An available RS-232 port (COM 1 or COM 2 required). Any further details, visit our web site at www.activewaveinc.com.